The 2018 Spring Issue of the Journal of Personal Finance is now available from the International Association of Registered Financial Consultants (IARFC). This practitioner oriented distinctive publication promotes research to examine the impact of financial issues on households as well as research on the practice and profession of financial planning. Do Interest-Only Mortgages Really Make Sense for Investors? For members of the IARFC, the Journal of Personal Finance is a benefit and a source of continuing education credits. Up to six credits of CE can be obtained by reading the entire edition. Members can then take the IARFC Journal of Personal Finance Online CE quizzes. Two hours of IARFC CE will be awarded to anyone who achieves a score of 13 or higher per quiz. 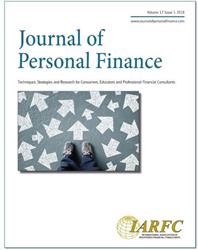 To order a hard copy or electronic version of the Journal, to find out more information or to review article submission guidelines, go to http://www.journalofpersonalfinance.com or contact the editor. Register to take the CE quiz at the IARFC Store.